The Glitter Band was the band that backed up Gary Glitter in his first years, I think from 1972 up to 1974, or something like that. They and the producer/songwriter Mike Leander were responsible for the exiting glamrock sound that the first* Gary Glitter* hits have. The band made some records without Gary Glitter in that period. I will not say that since Gary Glitter never was a great singer anyway, you don’t miss his voice on these records. Despite all the stupid and wrong things mister Glitter did in the past decades, he had that hard to define touch of magic that makes pop music lift you heart up. 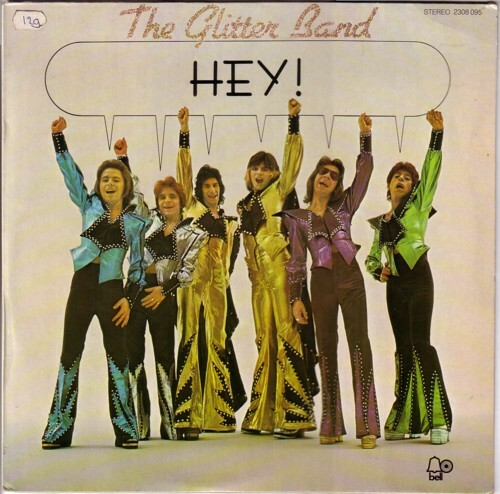 The Glitter Band does exactly as might be expected, and that is actually quite rare in pop. Usually musicians want to show their other sides, to explore their talents, to surprise their audience or to impress the critics. But Mike Leander took care that nothing of this sort happened: the 12 songs that ended up on this LP sound as if Gary Glitter took an afternoon off in the studio and the band decided to try how they would sound without him. They even recorded one his hits! I am pretty sure that I can hear the voice of Gary Glitter himself in the background, but I never heard or read that he actually sings along on this LP.